According to Salmond, A tort may be defined as a civil wrong, for which the remedy is an action for damages, and which is not solely the breach of contract or the breach of a trust or other merely equitable obligation. Where the breach of duty alleged arises out of a liability independently of the personal obligation undertaken by contract, it is between parties, if the duty in fact arises independently of contract. Breach of contract occurs where that which is complained of is a breach of duty arising out of the obligation undertaken by the contract. In tort, the duty is towards persons generally. 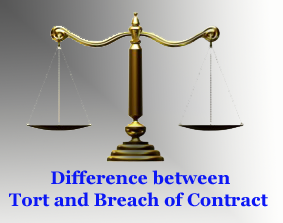 In contract, on the other hand, the duty is towards a specific person or persons. That is to say, the privity of contract does not apply in case of tort because there the duty is not towards any specific individual or individuals but towards persons generally. Tort being a private wrong, the party which suffers injury is required to file the suit against the defendant and at any stage of the proceedings may withdraw the suit by entering into any agreement of compromise with the defendant or even without it. In a breach of contract, nature of damages is always compensatory. In tort also, generally the nature of damages is compensatory but in cases of injury to person or character, exemplary damages may also be awarded if the facts of the cases reveal malice or fraud. In a breach of contract, motive of the party breaking the contract is immaterial. In tort also generally motive is irrelevant but sometimes it may be taken into consideration and in such exceptional cases, the evil motive of the defendant, if proved, will tip the scales of liability against him. A tort is a civil wrong which is not exclusively the breach of contract. A contract is an agreement enforceable be law. Contractual liability, therefore, arises out of agreement between the parties Tortious liability, on the other hand, arises out of a breach of duty which is not a breach of contract.